.. tools to examine characteristics and patterns of U.S. & state population by age, gender & race/origin, 2010-2015 annually .. access individual state and area profiles. What are the 10 states with the largest Hispanic population? How is Hispanic population distributed by age in the U.S. or any particular state? In which states does the Hispanic population comprise more than half of the total population? And by age? Get answers to these types of questions using data access and analytical tools described in this section. The following graphic illustrates use of the interactive table. Tools are used to select only 2015 and show only the total and Hispanic columns, then rank in descending order on Hispanic population. It is easy to see which states have the largest Hispanic population and in relation to the total population. It’s not just about Hispanic and total population; perform similar queries/analyses by gender and for each of the five major race groups. These data are based on the latest Census Bureau 2015 model-based population estimates released in June 2016. The data options are not limited to the 2015 data; annual revised data for 2010 through 2015 are included. Find out about the size and trends for specific age groups of interest. Use the interactive table to perform other types of queries/analyses described above. Click a link in the table to view an extended profile for each area. The profiles are developed using the Regional Demographic-Economic Modeling System (RDEMS). When a profile is opened (new web page), analyze these population by age by gender by race/origin in context of related wide-ranging, multi-sourced data. Access the profiles for drill-down geography including counties and other areas. The interactive table includes a row for the U.S. and each state. Column structure and content are described below the table. • Click the “link” (column 3) to view the RDEMS POP1 profile. • See about more operations and usage notes below table. Clicking the link for Arizona, as illustrated above, shows the full “POP1” table/profile for Arizona. Clicking the link is equivalent to clicking this link: http://proximityone.com/rdems/1/rdems04000pop1.htm. • click the above link now to view the full profile. .. there are 10 U.S. cities having population of 1 million or more … Chicago is ranked 3rd among all U.S. cities based on 2015 population. The population of Chicago, IL changed from 2,695,605 in 2010 to 2,720,546 in 2015 (24,941 or 0.9%). The population of the U.S. overall changed from 308,758,105 in 2010 to 321,418,820 in 2015 (12,660,715 or 4.1%). Examine population characteristics and trends of the city of Chicago in context of other cities and counties using the interactive table. Chicago is a principal city of the Chicago-Naperville-Elgin, IL-IN-WI Metropolitan Statistical Area (CBSA 16980). This section reviews selected geographic, demographic and economic characteristics of the city of Chicago and tools to analyze these data. 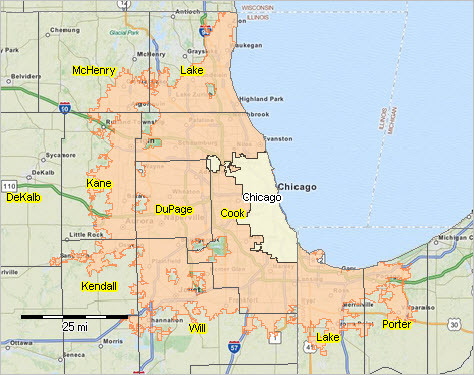 Chicago city is shown as green-fill semi-transparent area. … click map for larger view. View extended demographic-economic characteristics of Chicago in this table. Compare attributes of the city for 2012, 2014 and change. Annual demographic-economic estimates are available for all geographies for areas of 65,000 population or more from the American Community Survey (ACS). View Cook County tables from RDEMS. Click links below to view demographic-economic characteristics of the county. Use the interactive table in the related section to view, rank, query and compare annual population estimates for states, cities, counties and sub-county areas of interest. Use these tables based on ACS 2014 5-year estimates to view Chicago in context with other cities. Regional Demographic-Economic Modeling System (RDEMS) county table links are now embedded in Metro Situation & Outlook (S&O) Reports. Easily access the RDEMS county demographic-economic tables for metros of interest. … click link in the “Code” column to access a specific metro. Join in … join us in the Data Analytics Lab sessions to discuss more details about accessing and using wide-ranging demographic-economic data and data analytics. Learn more about using these data for areas and applications of interest.